Bill’s guide dog career began in 1977, when he joined the Guide Dogs for the Blind Association (U.K.). In March 1980, Bill graduated as an accredited Guide Dog Mobility Instructor. In 1984 Bill founded Canadian Guide Dogs for the Blind (Ottawa), where he served as President and CEO from 1984 to 1995. Bill is a Charter Member of the International Guide Dog Federation (IGDF), a 94-member global organization founded in 1988. He was elected to the Board of Directors in 1990, serving a total of 14 years. In 1992, Bill was appointed as an International Assessor for the International Guide Dog Federation, and has accredited schools in England, Ireland, Japan and Australia. He is the past Chair of the IGDF’s Accreditation Committee. 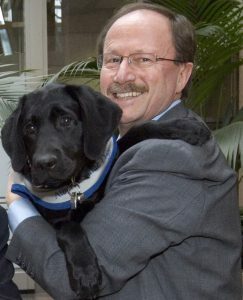 In 1996, Bill co-founded British Columbia Guide Dog Services, then launched Alberta Guide Dog Services as a division of BC Guide Dog Services in 2002. In partnership with BC Guide Dog Services, Bill has taken a leading role in the founding of Autism Support Dogs to help autistic children aged 4 to 10. In 2006, Bill was awarded the International Guide Dog Federation Ken Lord Award for exceptional services to the guide dog movement.